Today I will talk about getting started with choosing your investments. Learning about investing is important before taking the plunge and opening your first investment account. With so many different ways to invest, it is easy to get overwhelmed to the point of doing nothing. What I’ve found is that the more you learn about investing, the more you realize how little you know. You will never learn everything; it’s too complicated. That’s why I suggest learning the basics before getting started. Over thinking things will lead to paralysis, and not doing anything. As it turns out, simple investments usually end up producing better consistent returns than complicated investments. Invest in low cost, no load passive index funds that diversify by owning the whole market. Understanding risk will help you determine your own asset allocation. Keep tax efficiency in mind and never time the market. That’s it. If you can understand these concepts, you are good to go and ready to get started with investing. I recommend checking out this book at the library for free. Hands down, without a doubt, I recommend investing with Vanguard. As I’ve shared before, Vanguard is client-owned, so you only pay what it costs Vanguard to operate its funds. There are no loads, no sales commissions, and the costs are the lowest in the industry. For beginners who want to get started the easiest way possible, I recommend getting started with one of Vanguard’s Target Retirement Funds in your tax-advantaged Traditional or Roth IRA account. Vanguard does a quick comparison between Traditional versus Roth IRAs here. For most investors who qualify, choose the Roth IRA option. CAUTION: Owning a Target Retirement Fund is NOT TAX EFFICIENT and these funds should NOT be kept in any taxable account. One reason is because this fund contains bonds, which are very tax inefficient. Each of the Vanguard Target Retirement funds is a Fund of Funds. This means that each target date fund holds several index funds with different investments. By purchasing a single fund, you are diversified in over 12,000 U.S. and International stocks and bonds. There is no need to rebalance your asset allocation over time as these funds gradually become more conservative as time passes (on autopilot). Oh yea, and these funds are cheap (average expense ratio 0.17%). Choosing a target date fund is the best way to get started and diversified with only $1,000 minimum investment. If you wanted to purchase each of the index funds separately, you would need to spend $3,000 minimum investment per fund (minimum of most Vanguard funds). Plus, if you are opening an IRA right now, you can only invest $5,500 per year (starting in 2013) so it would not be possible to achieve the same asset allocation within your traditional or Roth IRA. You can get around the $5,500 yearly contribution limit by transferring your IRA or previous 401k from a different company. With target date funds, make sure you choose a starting asset allocation that you are comfortable with. These Vanguard target retirement funds tend to be aggressive for their suggested retirement dates. I personally like their aggressiveness. However, you should choose a risk profile that you are comfortable with. Vanguard has a risk assessment questionnaire for you to use here to help you determine your asset allocation. You can keep the suggested ratio of stocks to bonds in mind before choosing which target date fund is best for you. To adjust your target date fund to be more aggressive or conservative, you simply adjust the target date. The later the retirement date you choose, the more aggressive the asset allocation; the earlier the date, the more conservative the asset allocation. If you haven’t started investing in your traditional or Roth IRA yet, go to www.Vanguard.com, register an account, and then open a Target Retirement Fund. You will need $1,000 to open this account. Then you have until April 15th, 2014 to contribute a maximum of $5,500 for the 2013 fiscal year. Keep contributing through the ups and downs of the stock market and try to max your contribution every year. While Vanguard target date funds are no doubt the easiest, cheapest and best way to get started in investing, there are limitations. The best person to determine your asset allocation should be you. Choosing a target date fund forces you to conform to the asset allocation someone else has determined for you. The target date funds get more conservative with time, but you may not want to change your asset allocation. While target date funds work great in a tax-advantaged account like your IRA, not everyone solely invests in a retirement account. Many individuals also invest in a company sponsored 401k or in a personal taxable account. Most everyone has other savings goals beyond retirement such as: first house purchase, college fund for kids, or investment property purchase. The longer I’ve been investing, the more that I’ve been learning. While it was great starting out with my target date fund, VTIVX, I have moved on. As I have consistently accumulated a much higher balance in my investment accounts (taxable, 401k, and Roth IRA), it has given me the ability to look at all of my accounts as one big portfolio. Your 401k may have limited investment choices with some fund options that have expensive fees. Even so, there are probably some lower cost funds that you can select in your 401k. You can then complete your asset allocation with your IRA. For instance, if your 401k offers a good bond fund with a low expense ratio, you can choose to fill your 401k with this bond fund, and then balance out your IRA with only stock fund investments, or vice versa. My current asset allocation is 90% stocks and 10% bonds. Within my stock holdings I have 70% invested in US domestic stock market and 30% invested in International stocks. These 3 funds were chosen to try to mimic the Vanguard Total Stock Market Index fund using the Bogleheads guide on approximating the total stock market found here. Once you’ve built up a healthy account balance and feel more comfortable with investing, you can split up your target date fund components into individual index funds. This will give you more personal control over your asset allocation, and can even lower costs further. Once you invest $10,000 or more into individual Vanguard index funds, you are eligible for Admiral Shares, which will lower your expense ratios even more. Note: Vanguard recently added international bonds to their Target date funds. I personally am not interested in international bond funds at this time. Currently only one of my Vanguard funds qualifies for Admiral Shares, but within a year or two, I should have all of my Vanguard funds eligible for Admiral Shares. Once you are managing your own index funds, you may see your asset allocation shift. Let's say the stock market is doing really well, your asset allocation may now be over weighted in stocks. You will need to rebalance once a year to adjust your stocks and bonds holdings back to your chosen asset allocation. As time passes, you may want to slightly increase bond holdings per year if you want your asset allocation to slowly get more conservative. It’s easy to rebalance your asset allocation if you are in the money accumulation phase of your life (which should apply to any reader of my site). The simplest way to rebalance is by using new money (outside of the account) to only buy more shares. In your taxable account, contribute to under-performing funds. This is equivalent to “buying low” to balance out your desired asset allocation. Every time you sell shares in your taxable account, you will pay taxes (the amount of taxes you pay depends on how long you’ve held your funds). By only buying to rebalance in your taxable account, you will avoid getting taxed. If you’re only investing in your tax-advantaged accounts, you can rebalance by exchanging shares. You won’t be penalized with taxes for exchanging stocks for bonds in your tax advantaged account(s). You are only taxed with tax advantaged accounts when you start withdrawing money from your 401k or your traditional IRA. Everyone’s financial needs are different. I am a big fan of Internet message forums because you can get a wealth of real time responses from other individuals on personal questions that you may have. You can also read the questions other individual investors have asked about their own personal situation as well as multiple responses from those who offer helpful advice. I recommend reading and asking specific investment questions in the Bogleheads forum found here. This is probably the best message forum online for index fund investing. 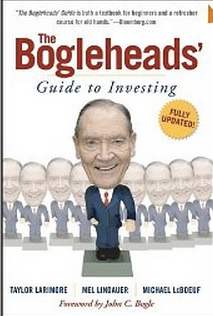 The Bogleheads are a group of personal investors who follow the principles of John C. Bogle, the founder of Vanguard. In these forums, you will find investors (new and old) who will be able to critique your investment portfolio, as well as give you unbiased advice as to what they feel is the best way for you to approach your individual situation. These are real people who have no financial incentive to help you. They truly just want to share the best of their knowledge of investing with you. Now go out there and start investing! You can thank me later.